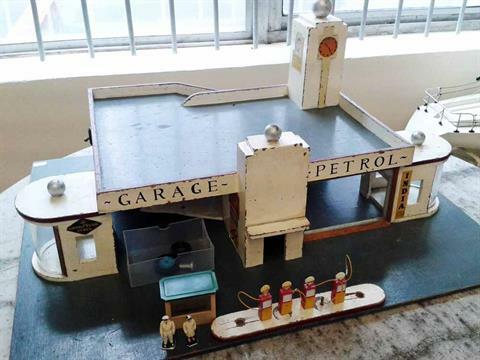 The Dinky Toys range of the 1930s, 40s and 50s has not been very well supplied with garages and related maintenance equipment, although some petrol pump stations were avaible still. The 1930s saw the no. 45 Garage and the no. 48 Petrol Station, but post-1945 there were no similar equivalents available anymore. 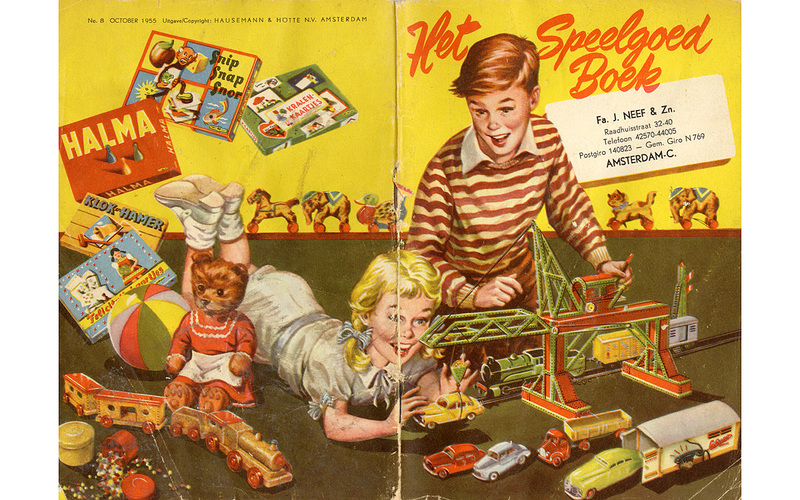 In the Netherlands at least two firms jumped into that hole in the market in the 1950s and supplied the children playing with Dinky (and any other) Toys with garages, pump stations, car bridges etc. Although they were suitable for general use, both of them, the official Dutch Meccano agent Hausemann & Hötte and the producer WICO of Nieuwer ter Aa (South of Amsterdam) explicitly mentioned and recommended such accessories for the use with Dinky Toys. Hauseman & Hötte had their own brand of small scale mainly wooden toys, Mini Toys. 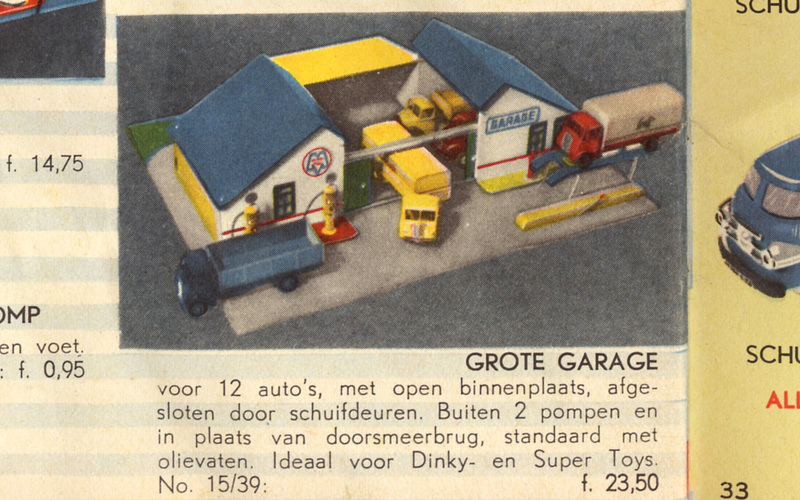 They were advertised in their annual ‘Speelgoedboek’ (Toy Book), in nice colourful illustrations showing the garages etc. in combination with current Dinky Toys. Wico started its range in 1953 and made an endless range of various wooden garages, all based on the same construction principle. When I was small my uncle who worked at Libertys gave me an Art Deco style garage perfect for Dinkys. It had a central office tower with golden ball atop. Two side curved bays for ‘showroom displays’. A rear ramp, and rooftop parking, and a moveable rooftop tower with clock face and flagpole. I think he got it from Hamleys as closeby to Libertys. I have seen one or two since. Not sure if a kit, ready assembled or just plans to make your own. Anyone know? I attach a recent photo of one if it loads. That is a fabulous item! 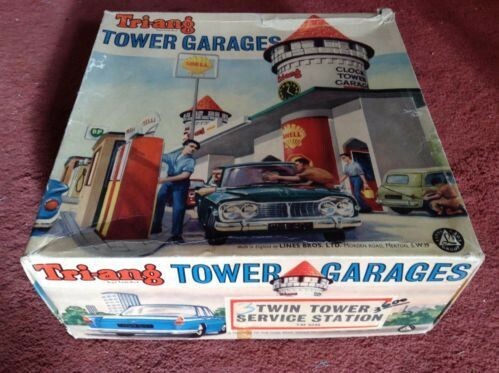 I in turn wonder if members have ever encountered the Triang Tower Garages item pictured. (No, I don't have one -- that would be an unimaginable dream since they must be very rare.) 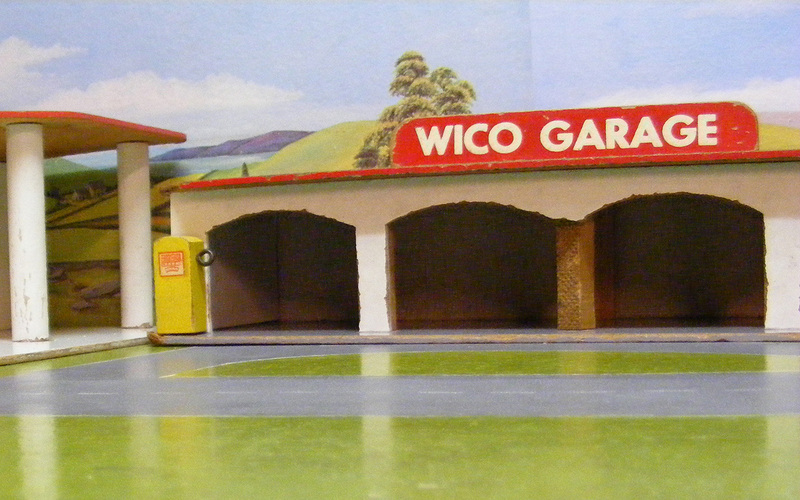 As can be seen, this garage was supplied complete with the Dinky Shell and BP gas pumps, making it practically a Dinky Toy. It must have been released after Lines Brothers acquired Meccano Ltd., and also after Spot-On had been shut down (since there were different Shell and BP pumps previously in the Spot-On range!). 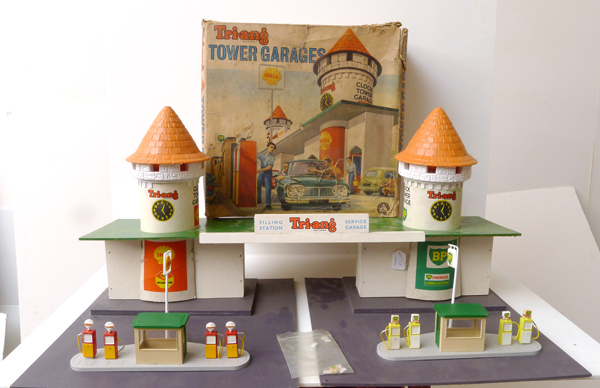 That is a fascinating detail, and I also find this garage interesting because as a boy I owned a Triang castle, which I used with Britains Ltd. knights. The orange roofs and turrets on the towers were identical mouldings to what they used in this garage!